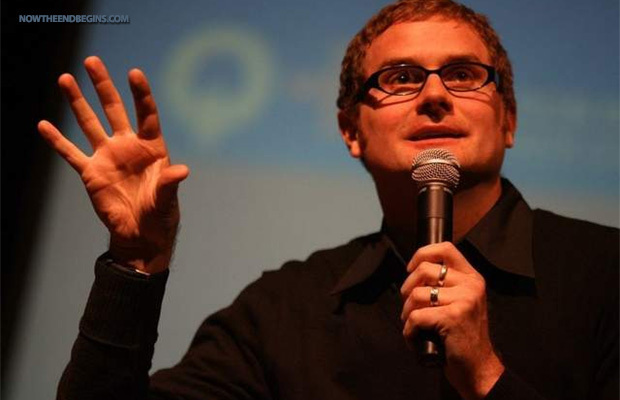 “In the beginning,” Rob Bell said, “was a point.” That point of energy went bang and, over some 13 billion years of “ongoing creation,” particles bonded to become more complex atoms, which bonded to become more complex molecules, which bonded to become more complex cells, which bonded to become human beings. Now, the spiritual inertia of the universe tugs at humankind to sustain that pattern of evolution, Bell said Wednesday, July 29, at The Intersection in downtown Grand Rapids. The founding pastor of Mars Hill Bible Church who moved to California three years ago, Bell came back to Grand Rapids to reprise an “Everything is Spiritual” speaking tour that he first did a decade ago. Talking about atoms rather than the biblical Adam, Bell gave a fast-paced, often comical sketch of the history of the universe, with frequent interjections of pop-culture references to music, movies and dancing Super Bowl sharks. Dismissing secular and churchy viewpoints, Bell said humanity is hard-wired over billions of years of evolution to progress toward greater equality and unity. “What those first Christians kept talking about was something called the body of Christ,” he said. “Whenever we move towards each other, it helps move the whole thing forward to an unimaginable future. What’s left of our national character?